Yes, I'm posting this month's edition of What I'm Wearing Now on the very last day of March. So I suppose it's not technically what I'm wearing now as much as what I already wore this month. To be fair, we just got back from vacation a few days ago, and I was making an effort to stay away from the computer while I was away. So there's my excuse. For those news to this series (now in its third month), the motivation behind it was mainly in response to our beginning-of-year reader survey, where many commented that they missed seeing outfit posts - which have admittedly dwindled down to once every couples of months since I had Essley. In an effort to share what I'm wearing at the moment without relying exclusively on my inconsistent outfit posts, I decided that I'd put together a monthly round-up collage featuring some of the clothing and accessory items (or the most similar pieces I can find, if certain items are sold out, old, or thrifted/vintage) that I'm wearing the most that particular month. March was a unique month, both because the weather dramatically changed mid-month (we had a 75 degree day on the16th; awesomely bizarre for Chicago in March), and because I spent a third of the month in Arizona. So while January and February were all about heavy layers, boots, and hats, this month meant mostly lightweight dresses, flowy pants, kimonos, denim cut-offs, sun hats, and sandals. I know it's a thing for bloggers to favor fall and even winter when it comes to fashion, but I'm a spring and summer style girl through and through. So these types of pieces are my favorites, and it was a treat to pull them out of my closet for a few. It's funny because next month's What I'm Wearing Now will likely be focused on much cooler weather clothing than you see here (or at least more jackets and layers). It will probably feel like backtracking from the pieces that I've been wearing the last few weeks. Underneath my April layers though, I'll be secretly counting down the days until I can bust out these summery styles again. Believe it or not, there will actually be a couple of real live outfit posts coming in the next couple of weeks as well. I took advantage of the insanely gorgeous weather and stunning surroundings in Arizona to snap some shots of my favorite outfits there. So stay tuned. I love the jeans jacket and shorts! Wish I could wear mine, but it's gotten unseasonably cold again. There's a hurricane outside as I write this! I'd wear anything here in a heartbeat. I'm basically living vicariously through you as it's still cold as F here! The fact that you're a summer girl at heart always shows through in the styles you choose for warmer months. I love this feature but I have to admit that I'm looking forward to seeing some real live outfit posts - I miss seeing your beautiful face in this space! 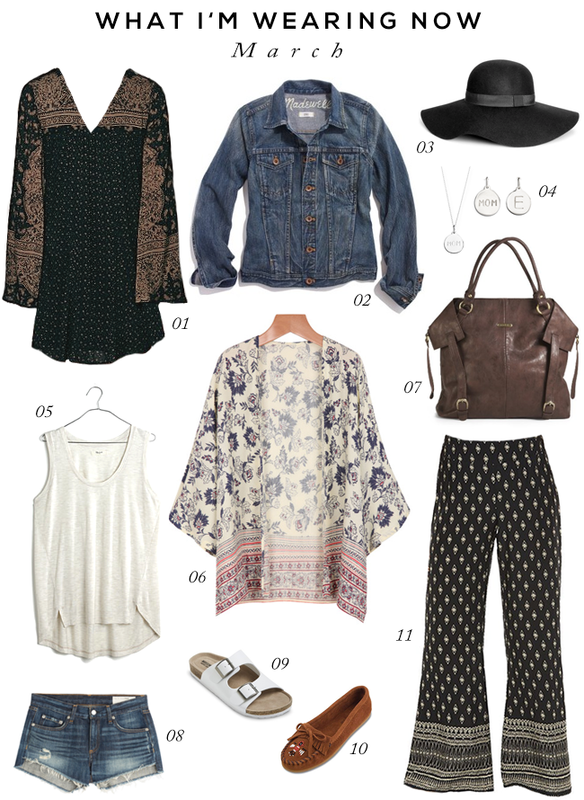 Love the top, loafers and kimono. I wish the temperatures would get higher, can't wait to where springy-things! Great Spring into Summer ensemble. Love the Minnetonka moccasins, I own a pair and they are the most comfortable shoes in my closet. Love the kimono -- and your signature floppy hat! Thanks for your comments you guys! Fingers crossed that we'll all have warm enough weather soon to be able to wear more of these types of pieces.